"This is always a hit when I make it for dinner parties and Boxing Day dinner because the chicken is always fall-off-the-bone juicy and people love the glaze. People always go for seconds! You may quarter 2 chickens instead if you aren't able to get just legs from your butcher, but I find the legs are juicier and save money. Serve this dish with fragrant rice and dilled carrots or roasted asparagus." Sprinkle chicken with salt and place in a large glass or plastic bowl. Whisk together honey, orange juice, butter, rosemary, orange zest, and garlic. Pour orange mixture over chicken; cover with plastic wrap and refrigerate at least 1 hour or overnight. 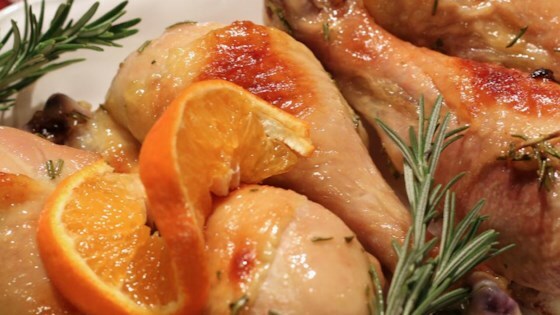 Place chicken legs in a single layer in a roasting pan; pour orange mixture over chicken. Roast for 30 minutes in the preheated oven; reduce temperature to 325 degrees F (160 degrees C). Baste chicken with pan juices every 20 minutes until chicken is a deep orange brown color, no longer pink at the bone, and juices run clear, about 90 minutes. An instant-read thermometer inserted into the thickest part of the meat near the bone should read 165 degrees F (74 degrees C). A lot of the orange glaze remains in the pan. I usually mix it into the rice or it can be strained and thickened with a bit of cornstarch and poured over the rice. Not bad,but not as good as I was hoping. This sounds yummy! I'm going to try boneless chicken thighs...and orange marmalade in lieu of oranges etc! This is absolutely one of the best marinades I ever had!! I used whole chicken instead of just legs...people were begging for the recipe! !